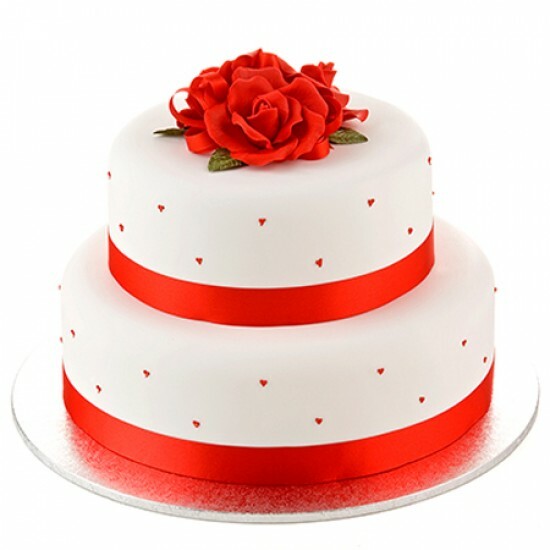 This beautiful two tier cake is fully iced with hand piped red hearts on both tiers and decorated with ribbon and sugar roses. This beautiful two tier cake is fully iced with hand piped red hearts on both tiers. Both cakes have a red satin ribbon around their base. The top tier is finished with 3 red sugar roses. We chose this cake for our wedding with red velvet flavour and everyone loved it. It was the most beautiful and delicious red velvet cake I have ever eaten and with a very afordable price. You guys done a magnificent job. I will be definitely buying my future cakes from you.